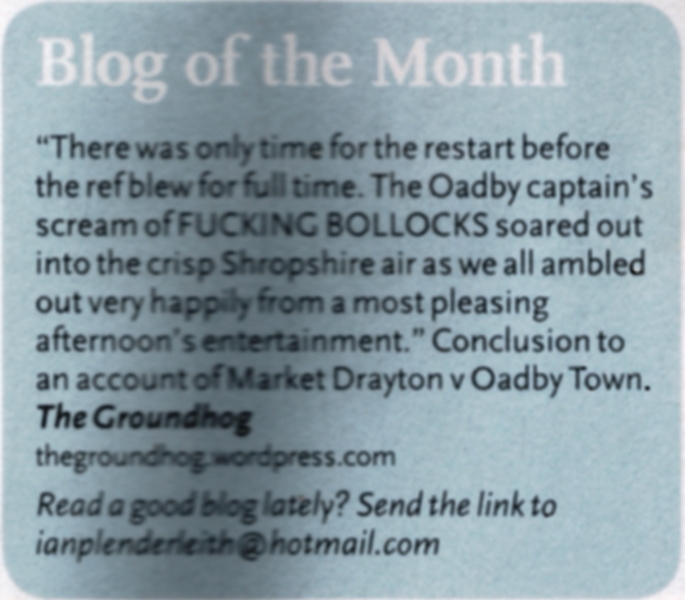 Running out of new grounds close by, I was trying to pick the best out of some of the nearby county leagues last summer, when I went to Middlewich Town. It is a very old ground at just over 100 years, used since 1912, the year the Titanic sunk (although the two events aren’t related). 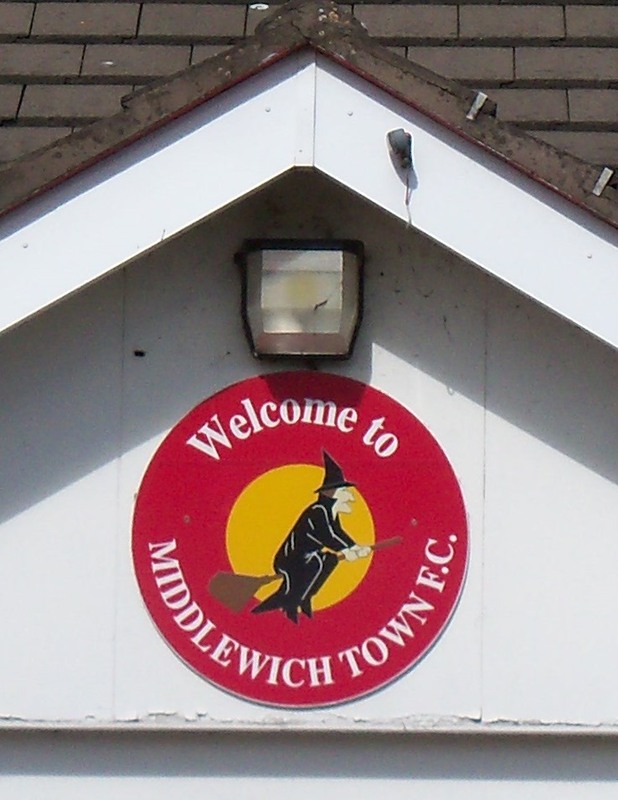 The ground was first used by Middlewich Athetic who then merged with Middlewich Town Youth in 1988 to form the present club. They finished mid-table in the Cheshire League last year. Middlewich Town’s main stand is probably the best I’ve seen in county leagues. It’s a fine old specimen, with a mathematically pleasing 84 seats, arranged symmetrically in six blocks, two rows and seven columns. 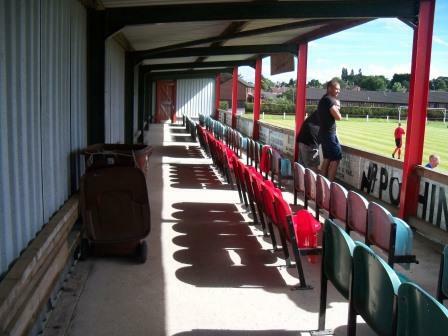 A nice oddity about them was that the home and away dugouts were cut out of the bottom of the stand. You could stand on the plank in the stand that forms the roof of the dugout, which my son did (with some jumping thrown in). I pictured his legs going through and onto the shoulders of a sub. On the other side is a smart small cover, on brick pillars, with a couple of chairs thrown in. 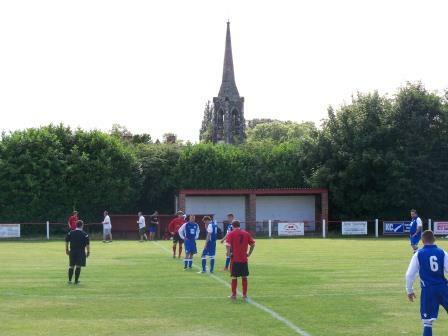 The surroundings are pleasant and leafy and to top it off there is a backdrop of a church steeple almost bang on the centre line, viewed from the main stand side. The clubhouse is relatively new and impressive build in the corner of the ground, with their club badge on the porch entrance showing their emblem of a witch on a broomstick. 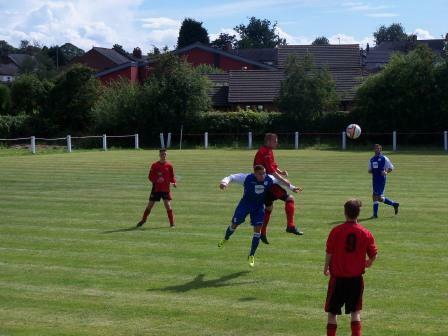 Middlewich won this game easily against Barnton Wanderers from the division below. However, this season hasn’t been kind to them as they lie rock bottom with a meagre 10 points. Well worth the trip, especially on a sunny day. This entry was posted in Travelog and tagged Barnton Wanderers, Cheshire League, Middlewich Town, non league football, Seddon Street. Bookmark the permalink. Great little stand and what a gorgeous day complete with the fluffiest white clouds.